Here's an excellent and affordable set I completely missed due to my hiatus. Upon first encounter, one might think this is a rare and expensive set because of its look. Granted, that would be a naive assumption to make because design on its own isn't what makes something rare. The level of rarity is usually equated based on a combination of other parameters such as insertion ratio, print run, and method of release. However, there have been a few instances where design has an influence on desirability, which has led to scarcity but this constraint isn't generally considered a standalone cause of scarcity. One such instance is that of 1998 Donruss Crusades. Inserted in packs at a rate of 1:14, 2000 Fleer Focus Pocus is a set that stands at the crossroads between beauty and availability. It's the ideal spot to be as an insert set. This crossroads is shared with a variety of inserts sets from the 1990s. Collecting is about enjoyment, not about outspending your colleagues. In this case, collecting 2000 Fleer Focus Pocus is one of those instances where collecting the set is enjoyable, pure and simple. I stumbled across this set from 2000 Fleer Focus years ago but well into the 2000s. My first card was a Tony Gwynn and I didn't give this set much thought until recently when I organized my collection in an effort to consolidate and better focus on what to keep and what to sell. The Gwynn made the cut so I've picked up a few more of these over the years via $1 boxes at shows and such. I've noticed that this is one of many sets that aren't discussed online to any significant degree, which is another reason why I decided to cover it here. This is also another instance where the scan doesn't do the card justice. This scan is nice but seeing these cards in person is just so much better. More akin to how insert sets were collated during this era, this 10-card set reflects an army-strong roster of superstars. 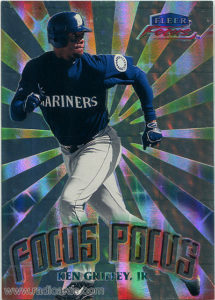 If you're on a budget but still want something attractive, try 2000 Fleer Focus Pocus. They seem to still be abundantly available and you won't have to fork over an arm and a leg to get them, which is nice for the novice and advanced collector alike. If you got into collecting any of the players featured in this set, tell us why.